Celebrating the last night that the future bride will have being single is one of those quintessential once in a lifetime events. You're going to want to do everything possible to maximize your fun on this momentous night of celebration and fun. There's no finer way to treat that bride-to-be than with a luxurious mode of transportation for her bachelorette party. When trusting this joyous evening's transportation to a Party Bus Los Angeles limo bus or limousine, you can rest assure that you will have no worries at all in getting everyone home safely at the end of your night's journey. You can trust the fact that you'll be entreated to the very highest level of world-class luxury imaginable in a vehicle that is both fun and comfortable beyond belief. Our party buses even have dancing poles for the more adventurous members in your group to enjoy or perhaps for the evening's entertainment. Whatever you decide to do on this big last night out, when you enlist the services of Party Bus Los Angeles, it will be done in a first-rate fashion. When you truly analyze it, this decision to hire professional transportation is a no brainer because let's face it, who wants to fight downtown traffic all night long as you drive to each venue on your list? Why not make it easy on everyone in your group? Our professional drivers know the roads like the back of their hand and will get you to where you need and want to go without one worry from you or anyone in your group. And you also have to consider how hard it is to find decent parking in the area. But none of that will matter if you let us handle this all important event. And something else that you won't have to worry about is getting to where you need to go because we have certified mechanics who are constantly keeping every one of our amazing vehicles in road worthy condition. And you are going to love our professional drivers, they will take the best care of you. Now, we have to discuss the features we have installed. We know of many folks who have aptly nicknamed our vehicles, a party of wheels, they did so for very good reasons. We guarantee you that the party will never end when you are travelling on one of our loaded party buses. The first thing you are going to notice when you step inside are the highest level of amenities we could find. First and foremost, you and your group are certainly going to enjoy stocking our cavernous coolers and bar areas. We will stock the coolers with ice and you can bring on board your favorite beverages... Adult and otherwise. Not a bad start, eh? We also know that ladies love to dance and you are going to find a hardwood dancing floor on board along with an unbelievable stereo system that comes complete with booming subwoofers. So, feel free to bring your favorite music along and have a blast moving to the groove. The interior also has LED color changing lights which definitely creates a fun atmosphere. When you are getting tuckered out and feel like a rest, you will find some amazingly comfortable wraparound leather seating and some awesome high definition flat screens. Telling you that you are going to have an amazing time is one thing, once you experience it, you are going to be ecstatic. So, without further adieu, trust us with your bachelorette party needs and you will not be sorry. Call one of our professional customer service agents today and after a few questions, they will guide you to the very best vehicle for your situation. It is our goal to forge a long lasting relationship with our customers. We want you and your group to have the time of your life and we know that we are just the ones to deliver that kind of experience. 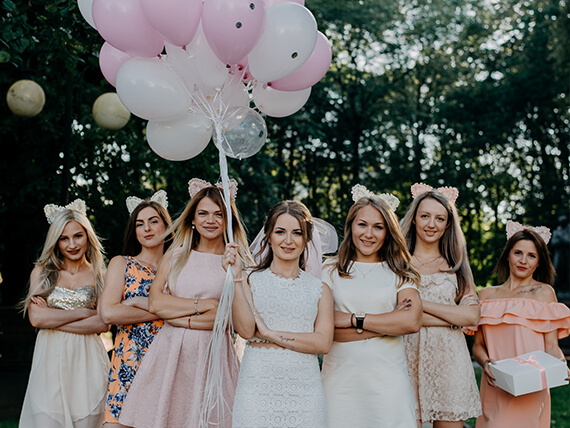 We can't wait to start out our conversation with a smile, and then proceed onto helping you plan the most incredible bachelorette party ever! Click here to view our fleet!